Fold and go design makes the Go-Pod the perfect choice for use both indoors and outdoors. Easily unfolds and can be moved from room to room. The KidCo GoPod is a lightweight and portable Activity Center to keep your child safe and entertained at home or "on-the-go". Simply fold up, put it in a handy carrying bag with storage and take it with you anywhere you go. 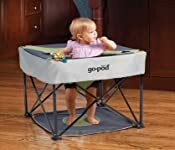 The KidCo GoPod Portable Baby Activity Station features a floor pad to keep little one’s feet from touching undesirable surfaces and a locking button to ensure the safety of your baby. It is a great item to have for your growing baby thanks to the four seat height positions. It is easy to adjust so it can grow with your child. Five nylon toy loops located in different places at the top of the GoPod hold your baby's favorite toys in place and within reach. 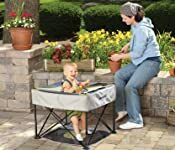 It also sports a drink and snack holder so your child will have everything they need to stay safe and entertained while you relax a little bit. Folded dimensions: 6.5"L x 6.5"W x 29.5"H. Open dimensions: 24"L x 24"W x 19.5"H (at lowest seat level) . 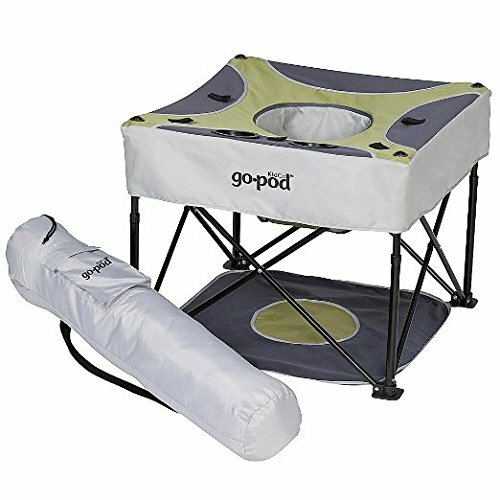 PERFECT FOR INDOOR AND OUTDOOR USE - Fold and go design makes the Go-Pod the perfect choice for use both indoors and outdoors. Easily unfolds and can be moved from room to room. LIGHTWEIGHT AND PORTABLE - The KidCo GoPod is a lightweight and portable Activity Center to keep your child safe and entertained at home or "on-the-go". Simply fold up, put it in a handy carrying bag with storage and take it with you anywhere you go. SAFETY COMES FIRST - The KidCo GoPod Portable Baby Activity Station features a floor pad to keep little one's feet from touching undesirable surfaces and a locking button to ensure the safety of your baby. EASY TO ADJUST - The KidCo Go Pod Portable Activity Station is a great item to have for your growing baby thanks to the four seat height positions. It is easy to adjust so it can grow with your child. 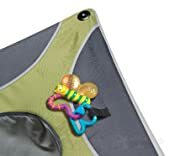 FIVE NYLON TOY LOOPS - Five nylon toy loops located in different places at the top of the GoPod hold your baby's favorite toys in place and within reach. It also sports a drink and snack holder so your child will have everything they need to stay safe and entertained while you relax a little bit.